For anything prior to the start see the pre-race report. I never thought the Ironman swim start would be a relief but it was. The second that cannon went off I finally forgot about the cold water, put my head down and went. Let the hitting, kicking and shoving begin. Having been mentally prepared for the worse made the whole thing easier. Think of all the idiot's you drive near in traffic; veering, cutting you off, almost getting accidents. Now picture those people swimming next to you; hitting, kicking and shoving; 2,900 of them to be exact. Quick video of what it looked like below. 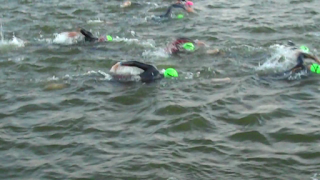 The swim is an out and back course in Tempe Town Lake, along the river's side wall. I could see Jamie running along the side for about the first 3/4 of a mile. 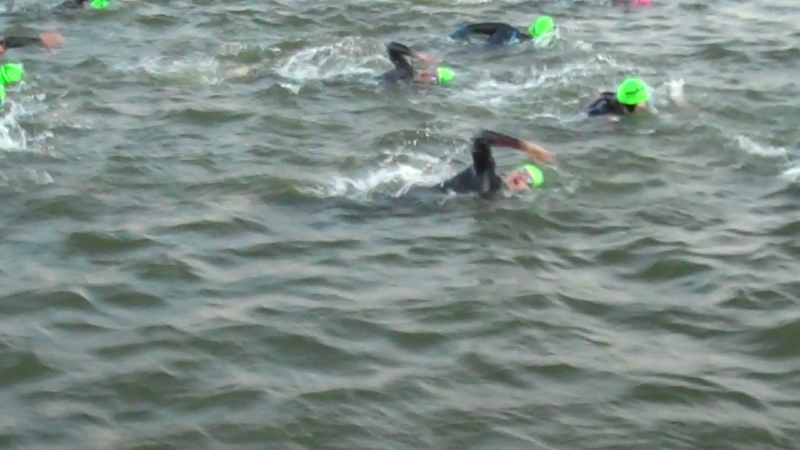 At some points I would feel I had an opening and had gotten away from people only to soon be consumed by more swimmers. 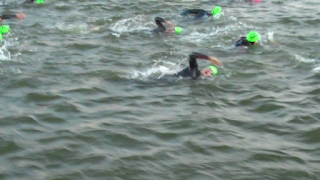 It was hard to get in a real rhythm, not that my lack of swim background ever gets in a great rhythm. Just before the turn I got kicked pretty good in the face, jamming the left side of my goggle into my face. I debated for the next couple of minutes if I would stop to clear the water that got in. Once I decided the answer was no I forgot about the sloshing water near my eye. There seemed to be no true "sighting" on the way out with the rising desert sun in full view at the end of Tempe Town Lake. After the turn everything was much more clear. I could feel my right leg cramp slightly, I stopped kicking all together for a 100 yards or so to relieve the compression from the wetsuit on the legs. I took full assessment of how I was feeling at this time and realized that today was going to be a good day. I made the final turn on my way to swim exit and got to the set of stairs to exit the water. I had to wait what was probably a minute for two gentlemen in front of me to get up on the stairs and out of the water. 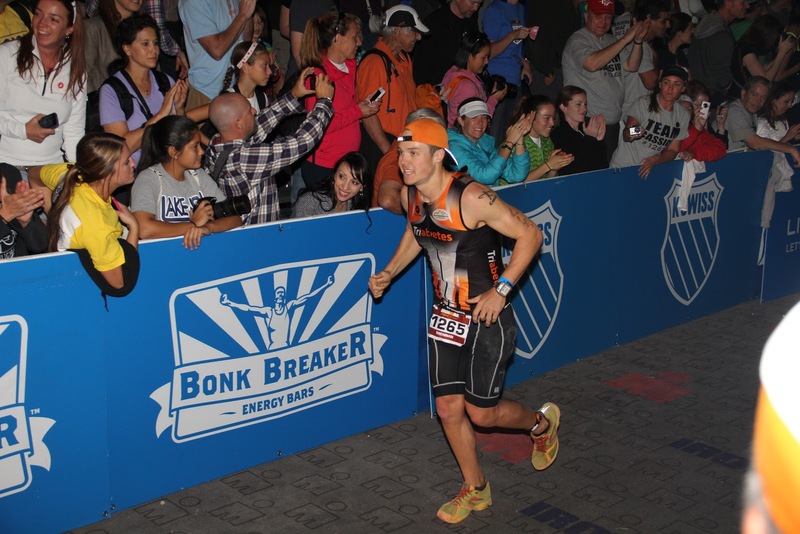 When I first stood up my left leg cramped again, a few longer strides and it went away. At this point I could see the race clock; 1:18. Thank you Jamie for working with me on the swimming this last year. Without you I'd still be in Tempe Town Lake struggling for air. Another thank you Ben Lablonc who convinced me when we graduated college that it would be a good idea to start learning to swim. Ironman uses wetsuit strippers, why anyone would volunteer for this blows my mind but Jamie made a good point that morning; "Don't let them pull the top off your wetsuit, they'll rip the omnipod off (insulin pump)". At that moment I had that very thought. I pulled the wetsuit down far enough below my lower back then let the wetsuit strippers pull the wetsuit off my legs as I sat on the ground. I got back up and started running, back to not knowing how the transition bags would work. I had two gels in my hand that I kept in my wetsuit for a potential low blood sugar. I saw a friend from Sergio's workout and after passing thought how I should have thrown them to him. Next person I knew, Lyndsay Riffe, got the gels. I grabbed my transition bag. Saw people sitting on the ground and did the same. A race employee didn't like this, "you can't change out here!". "I'm not getting undressed", I yelled back. She yelled it again and I yelled back the same thing. It was a stressful moment. This is what they get for not explaining transition. I dumped out my belongings, first throwing on my vest I had loaded with food and my heat sleeves. I started to take my blood sugar and my first thought was; "I get one shot at this, if my fingers are too wet I'm not doing this a second time". It worked, 134, it was a happy moment to see that number. I took the syringe out of the case and gave myself the injection. Cycling shoes and helmet on. Wetsuit in bag. Start running to bike. I don't remember how I grabbed the bike or handed off the bag but some how all of that happened. For the recond, if you don't have diabetes (or some other issue) and you're transitions are slower than this, get it together. The Arizona bike course is three loops, it's an out-and-back course that goes uphill on the way out and back down on the way in. As soon as I got out on the course I started eating. Honey soaked gluten-free waffles! Delicious. The first loop was pretty uneventful. The course at this point was packed with riders. All 3,000 participants in small lanes of traffic. I heeded a friends advice from Sergio's workouts and kept the pace easy for the first twenty miles, there's no reason to push anything during a long day. 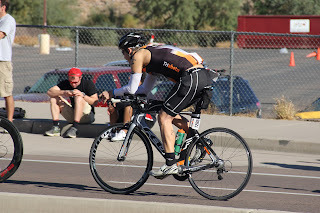 While triathlon is suppose to be draft free, there was no help but riding in packs at this point. Course marshals were giving penalties to everyone. After an hour I decided it was time to check if my blood sugar was in line. Except...no meter. I checked my pockets multiple times. No dice. I either dropped it or left it in my transition bag (next day when I looked through my bags I found I had left it in the swim-to-bike bag). I would have to rely on the continuous glucose monitor (which for those of you not familiar with diabetes, it isn't always the most accurate thing during exercise). Six hours, no testing. 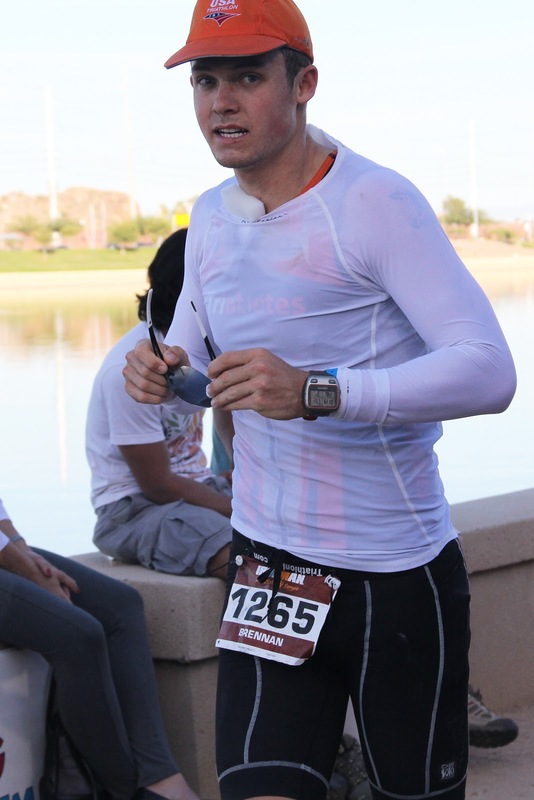 I dropped my vest and cotton gloves near the end of the first lap. Getting the vest off was not easy but I'm really glad I had it during the chilly morning hours. It was also at this time that my stomach started to rumble. 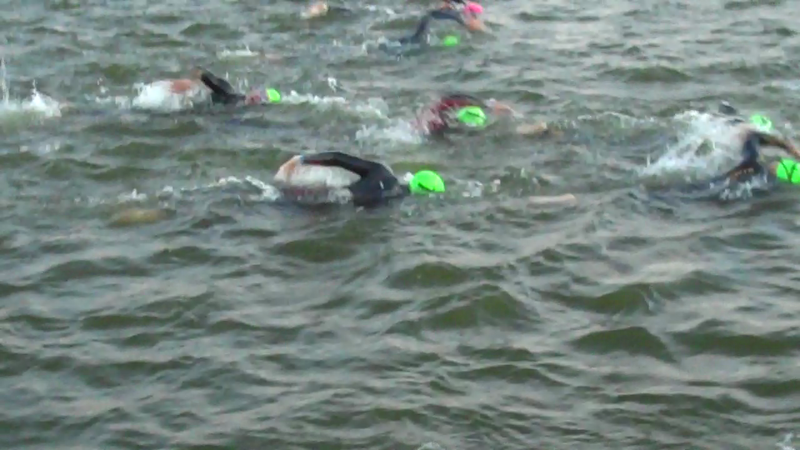 That bathroom break I felt when my wetsuit went on (see post about prior to the race) was starting to show its face. It was decision time. Stop for a seated bathroom break (if you know what I mean) or fight through it. I weighed the options in my mind and realized I wouldn't be able to keep eating comfortably if I didn't stop. After passing the cheering fans I stopped on the second lap at the first aid station, where Jamie and I volunteered last year. The fastest bathroom pit stop ever, three minutes according to my bike computer and I was back on my bike. At the end of the race, I'd come to want those three minutes back but it was needed. At least this wasn't "race induced" bathroom break, just a natural break for the body. I started to hammer again and was up and back down the turn around. The headwind coming back down this time was a little stronger. I caught Blair on the bike around this point. I'm pretty proud of pranking her. I could tell it was the Insulindependence jersey so I yelled out "Get out of the way" (she was riding perfectly on the side like we all should be, not in anyone's way). She started looking around like crazy, so funny at the time. "Brennan! I was going to say, I wasn't in the middle of the lane". She would later pass me on the run while looking like a gazelle, myself a wounded shot elephant. She had an awesome race and I hope to convince her to another one some time. 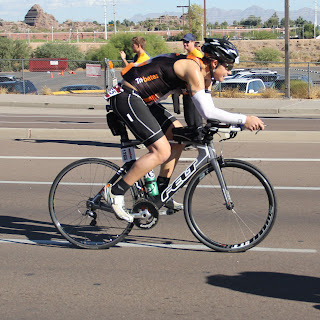 I felt great the whole bike. I tried to hold back not knowing what the run would bring. I grabbed water at each aid station, taking the right amount of salt tablets and eating a lot. My continuous glucose monitor read great blood sugars the entire time and I had to trust it was correct. I will say I was happy when the bike was over, 112 miles is a long way. 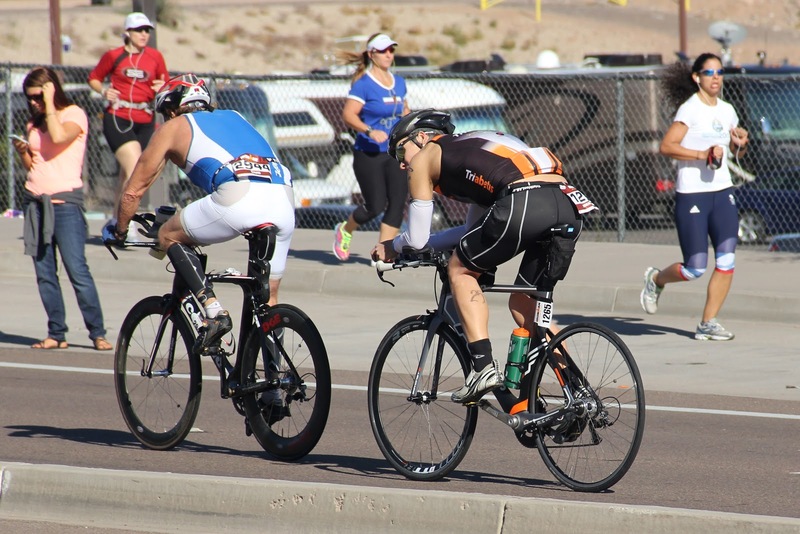 Off the bike, grab the run gear bag and put on the shoes. Funny that both Peter and Blair had the same stories after the race. The volunteers are almost...too nice. Hovering. Do you need anything? I can help! Should I take this? Should I take that? No, no, it's okay. I put on my shoes, visor and heat shirt and ran with my gallon zip lock bag full of run items. I use that gallon bag to slow me down off the bike. I want to run slow to start and this helps. There's no reason to start sprinting off the bike when you have a marathon to run and you've just biked 112 miles. Yanking items out of the bag; watch on, new blood sugar tester in my pockets, new gels and a water bottle. Dropping the bag next to a cameraman and the run was on! As soon as I had everything in my pockets I took my blood sugar while running. 141. No complaints there. My inner thighs were cramping a bit but it went away after the first two miles. I had downed a gel at the end of the bike so I waited to eat again. At this point I was consuming mainly Vega gels and coke at the aid stations. 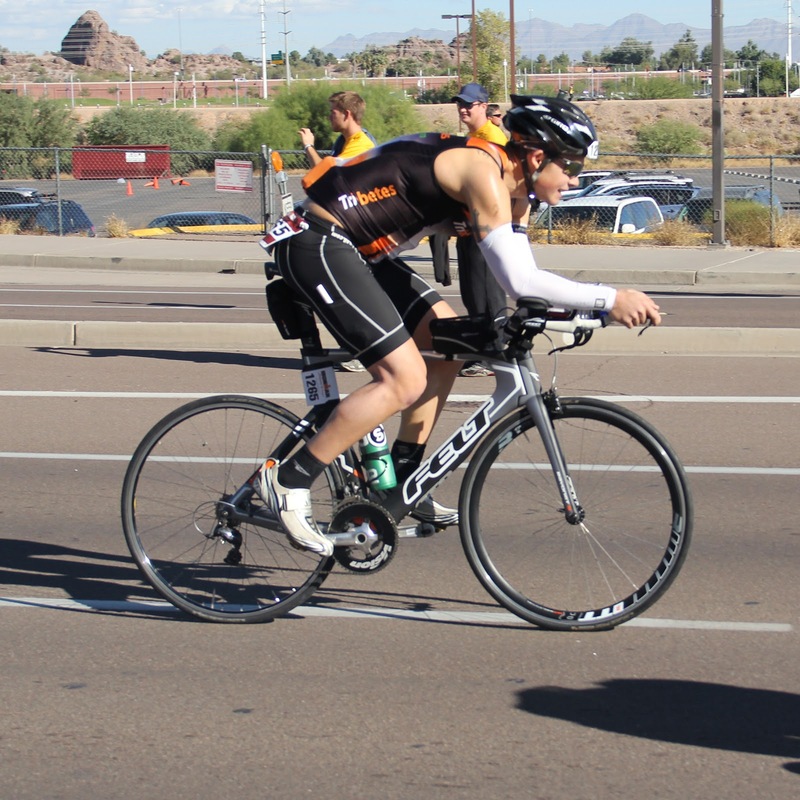 The run was much more fan friendly than the bike course. It's essentially a figure-8 loop with everyone passing friends and family twice. Getting to see everyone and hearing people cheer your name really helps in those dark moments when things start to hurt and the mind asks how long a marathon truly is. Big thanks to Nate Heintzman for setting up the tent so my parents, Jamie, Jamie's Mom Ann, Felicia Gelsey, Tom Reiber and many others had a place to cheer us all on! Also big shout out to Blair's Dad, Dean, for all the awesome pictures. The second time I saw the fan group on my way around I stopped and gave Jamie a kiss. I'm sure she was plenty embarrassed but it put a smile on my face. I felt great during the first ten miles, only ever slowing down to get water and coke down. Things started to unravel at that point, not terribly but it started. I took my blood sugar around this time and it was over 300. I don't know if the pod (insulin pump) was failing or I simply didn't have enough insulin going in me from my plan. I gave myself a very small dose via the insulin pump and after 30 minutes it hadn't come down so I used one of the syringes I had in my tri-shorts. Somewhere between mile 14 and 15 I made myself throw up. I'm not sure what upset my stomach. It may have been partly the high blood sugar, my other guess is the orange I had around that time. Either way I felt better after things came back up. At this time I took three Tums. I didn't totally know how this would go over in my body but I felt great after (I owe this strategy to Greg Sexton, thank you Greg). Next long race I'll start taking the Tums right when the run starts. There's a lot of time to think out there. A lot of time to think about why you're doing this, what it means to you. I thought a lot about playing catch with Dad when I was a kid. How those games of catch lead to this moment. I thought about how happy I was for family to be at the race. 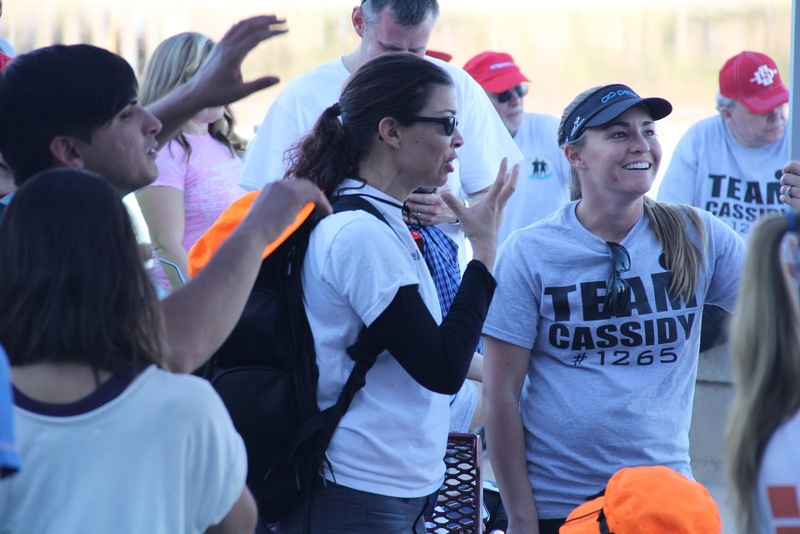 It's those small thoughts that can get you through the race. Starting the third loop felt good. The mind had temporary relief that it was near the end. I couldn't come up with many positive thoughts this last lap. Mile 18 on was like an atomic bomb going off in my body. What hurt the worse was my feet honestly, I don't know if I'd wear Newtons again, their "lugs" started to hurt pretty bad once running form broke down. The knees ached as well but nothing that would stop anyone. Truthfully, for being this far into my first Ironman I felt as good as I could have hoped. I started running 3 minutes, walking 1. I figured I could do anything for three minutes. The walk pace was quicker than your mall walker but still not fast. I had broth at the aid stations this lap. 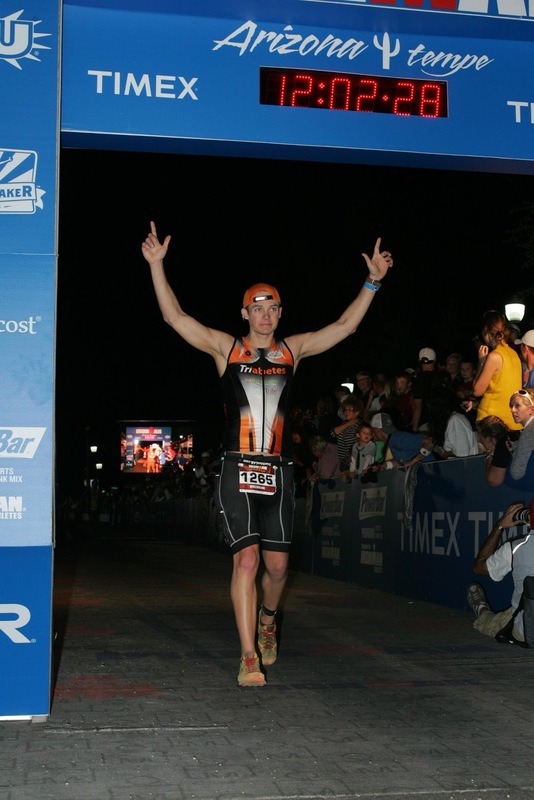 Curiosity of Jeff Temple's Ironman Louisville blog post I knew when the stomach was failing this would help. Seeing the mile 25 sign was like seeing the light at the end of the tunnel. I could hear the cheers of the finish line. Coming around that corner was one of the greatest feelings I've ever had. I slowed down a little and tried to take it in. I heard Jamie yelling, ran pass and then came back to grab her for kiss. This was what all those early mornings and long rides were for, this moment. Below is video taken by Jamie. I crossed the line and was then grabbed by a volunteer. Passed through the shoot and got to see my family. Seeing the smile on Jamie's face and then my parents made everything worth it. Blood sugar at finish 161. If I could go back I wouldn't change anything. For my first Ironman the stomach issues were relativity minor thanks to the knowledge imparted on me from friends during Sergio's workouts. I had great blood sugars until the second half of the run and I have Cliff Scherb to thank for that. I finished very happy. Crossing that line was the accomplishment of a lifetime and I hope to do more. I've gained many new friends through training, new experiences and learned a lot about myself and the way I want to live my life. Excellent job. I was following you guys online all day. Congratulations!